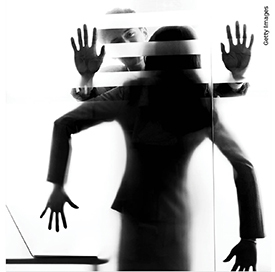 Investors and the public will no longer tolerate personal misconduct by executives. Now, boards have to do the same. Not every day does the CEO of a large public company contentedly smoke marijuana on a podcast (which was also recorded on video), shortly after tweeting he has secured funding to take the business private, blindsiding the board of directors. But this is Elon Musk after all, the Johnny Depp of CEOs. Musk took Tesla’s institutional investors, shareholders, employees, and customers on quite a hair-raising ride in the second half of 2018. His abrupt tweet about having secured funding to take the company private culminated in a decision by the Securities and Exchange Commission to strip away his chairmanship, fine him and Tesla $20 million each, and mandate the appointment of an independent chairman and two independent board directors to oversee his communications. The swashbuckling billionaire CEO isn’t the only person running a public company whose bizarre or inappropriate actions have been in the spotlight. Much worse than Musk’s cryptic tweets are accusations of sexual harassment against 273 business, media, and broadcasting executives, according to Temin and Company’s #MeToo Index. Among them are former CEOs Leslie Moonves (CBS) and Steve Wynn (Wynn Resorts). In this age of 24/7 social media feeds, chief executives and other high-ranking corporate officers — the public faces of their companies —have never been more public. Careless comments, thoughtless actions, and criminal conduct go viral quicker than you can say “resignation,” damaging a company’s reputation and all the businesses and people that rely on the organization for their livelihoods. Some CEOs curry the attention. Nothing wrong with that if their statements and deeds enhance their organization’s long-term financial performance and their social media quips don’t violate securities laws governing material misstatements. The ability to transform a CEO’s fame into corporate and product brand-building is a positive, but there is a downside if their fame is used carelessly or inappropriately. A CEO’s (or any other corporate officer’s) unguarded comments or conduct can unmoor the corporate ship and attract government investigators. They can also affect how people within the organization treat their subordinates. “The CEO sets the tone and the culture of the organization; if they raise their voices, use profanity, or express certain beliefs, others in the company may infer these behaviors and beliefs are OK,” says Ron Shah, CFO of Hodges-Mace, a provider of employee benefits services. Bear in mind that Ford, a brilliant mechanic and businessman, dropped out of high school after ninth grade to work on the family farm. His geopolitical expertise was formative, at best. [Editor’s note: Russ Banham is the author of the book, “The Ford Century.”] Ford’s fulminations ended when Jews boycotted the company’s motorcars. With sales slumping, he retracted his anti-Semitic comments. Even in the era of the personal computer’s invention, a video recorder wasn’t in the hands of every consumer to document boorish acts, and the Internet wasn’t around to disseminate sordid video clips instantly. No longer is this the case. Travis Kalanick, the founder and former CEO of Uber, allegedly tolerated a workplace culture that included sexual harassment and discrimination. He also famously berated an Uber driver from the back seat of the driver’s car while the dashboard camera filmed the flareup. The ill-fated trip was the last straw for shareholders, who mounted a successful revolt to remove Kalanick as chief executive. If YouTube and other video-sharing sites aren’t pushing transparency enough, anonymous employee feedback sites like Glassdoor and Indeed provide an anonymous forum for people to lift the veil on their bosses’ transgressions. A recent exposé published on LinkedIn, for instance, disclosed the conduct of the CEO of a Seattle-based government agency, who “looked women up and down” and pitched temper tantrums, on one occasion kicking an office chair across the room. Many companies have made great strides in setting employee conduct policies, and at large multinationals these highly designed, magazine-like documents can run 30 to 40 pages, even guiding workers about what to do in sticky situations. (The Starbucks code of conduct tells baristas how to handle an inappropriate email from a co-worker.) Presumably, these codes of conduct apply to everyone from the CEO on down. But in many organizations, the rules are elastic when it comes to the head honcho. The problem is that many boards hire CEOs who, by nature, are overconfident individuals. 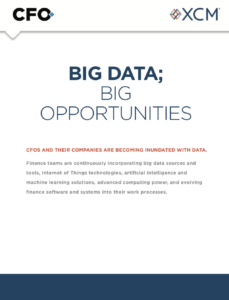 Smart CEOs say dumb things for a variety of reasons, chief among them raging overconfidence. When the weighty crown of celebrity is placed upon such big heads, it creates a compulsion to engage followers on social media with the brilliance of their beliefs on most every subject. Musk apparently was given leeway to do whatever he wanted by his handpicked board because of his wildly creative and obsessive ways. “Most CEOs filmed smoking pot in an interview would be gone the next day,” says Stephen Horowitz, CFO of CareCentrix, a national provider of post-acute home-care services. But even smoking marijuana on a podcast seems to pale in comparison with the flood of sexual harassment accusations being levied at CEOs and other corporate executives. In those cases, directors can no longer look the other way. Indeed, many corporate officers lead their organizations with humility and empathy. According to psychological studies, humble CEOs are more self-aware of their strengths and limitations and are more open to others’ ideas. Research also indicates that empathetic CEOs more deeply appreciate employees’ need to engage in meaningful work and value their contributions more fully. So, is there a way to balance the visionary genius of a Jobs, Kalanick, or Elon Musk with their eccentricities? Certainly, directors should not stifle a CEO’s creative impulses, despite their seeming eccentricity. But there are ways to keep these rogue entrepreneurs in check. Sensitivity training — making people more aware of behaviors that may inadvertently cause offense to others — is a good start. At the very least, it might guide CEOs to curate what they say before they say it. Bosses who fail to follow these behavioral standards may be outed, whatever their age. But Saia says companies can also build their own anonymous feedback sites to ferret out indications of a problem before it blows up into a scandal. 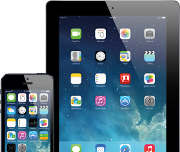 He also advises the use of real-time technology tools that take the pulse of a company’s reputation. “Using machine learning, data analytics, and image-recognition software, you can ferret out and monitor what people are saying about your products, services, and workplace culture to nip things in the bud,” he says. Unseasoned CEOs can be provided a mentor drawn from the board, such as the lead director or board chair. History suggests there is merit in this concept. Apple’s board forced 30-year-old Jobs to resign in 1985 for being overly demanding and difficult to work with. Eleven years later, the board chair, Edgar Woolard, brought him back to lead the foundering company. “Most important was that Woolard served a vital role as Jobs’ sounding board, confidante, and critic, helping to keep him in line and put Apple back on track,” says Sheila Hooda, CEO of Alpha Advisory Partners and a member of two boards (Virtus Investment Partners and Mutual of Omaha). Says Hooda: “The board has a fiduciary responsibility for the organization’s culture, reputation and long-term financial performance — all of which rest upon the CEO’s ethics and integrity as the culture champion of the organization. 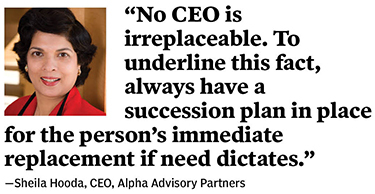 No CEO is irreplaceable.” To underline this fact, she suggests an organization should always have a succession plan in place for the person’s immediate replacement if need dictates. Depending on the violation, the CEO could retain a role in the organization in return for forfeiting part or all of his or her incentive-based compensation. In cases of serious offenses, the executive could be pink-slipped along with the monetary forfeiture. 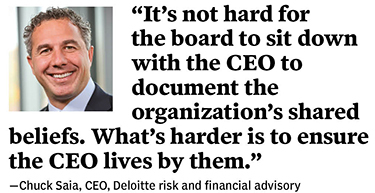 Boards of directors also have to be careful of the context in which they let executives go. Sexual harassment allegations by six women against Moonves led to his resignation in September. CBS is now on the hot seat for the former CEO’s severance package — a whopping $184 million exit payout, unless it is determined he was “fired for cause.” Two independent investigations are underway to figure out whether the allegations legally provide the means to give Moonves nothing. Likewise, Sergey Brin, president of Google’s parent company Alphabet, reportedly gave a “hero’s farewell” and a $90 million severance package to Andy Rubin, creator of the company’s Android operating system, upon the latter’s resignation in 2014. What was not revealed at the time was why Rubin resigned — he’d been accused of coercing another employee into a sexual act. According to The New York Times, Rubin is one of three former Google executives accused of sexual misconduct who received substantial exit packages, all shielded by the company. Who in an organization can prevent such blatant errors in judgment? While boards of directors play a critical role in taming CEOs’ behavior, there may be a role for the CFO as well. Workers’ off-duty acts may be protected by state laws. In this hyperpolitical, tense social climate, it’s not just CEOs whose actions are under a microscope. Many workers, professional and otherwise, have been caught on a smartphone camera outisde of work behaving, shall we say, shamefully. Others have been dismissed after posting inexcusable offensive comments on social media. In the world of at-will employment, companies often don’t hesitate to let workers go. But in some states, there are specific off-duty behaviors for which you can’t fire someone. The following are some examples. Arizona — Employers may not threaten or intimidate employees in ways that would influence political opinions, views, or actions; enclose written or printed political propaganda in pay envelopes; or post political notices or threats should a particular candidate be elected. Connecticut — Employers may not subject an employee to discipline or termination based on his or her exercise of First Amendment rights. However, an employer may discipline an employee if the exercise of those rights interferes with job performance or the working relationship between the employee and employer. Massachusetts — Employers may not threaten or attempt to influence an employee to vote or to withhold a vote. They also may not threaten or attempt to influence an employee to give or withhold a political contribution. New York — Protects political activities, recreational activities, union activities, and legal use of consumable products outside of working hours and off of the employer’s premises. Off-duty activities can be restricted if they create a material conflict of interest related to the business. Russ Banham is a Pulitzer-nominated financial journalist and best-selling author.